S S Rajamouli’s Baahubali is getting bigger day by day. 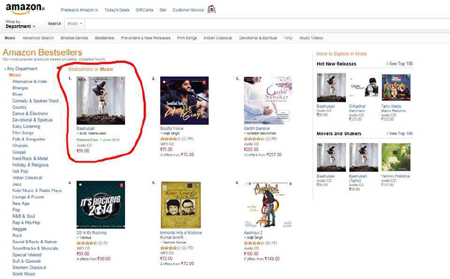 It is a known fact that the audio release of this film is nearing soon and latest reports reveal that the pre-release album which is up for grabs on Amazon, is leading the top sellers category. M M Keeravani is composing the music for this film which is produced by Arka Media. Lahari music has bought the Tamil and Telugu audio rights of this film for a whopping three crores. The audio launch is planned on the 31st of this month in the Hitex grounds in Hyderabad and the entire unit will be present to unveil the audio.